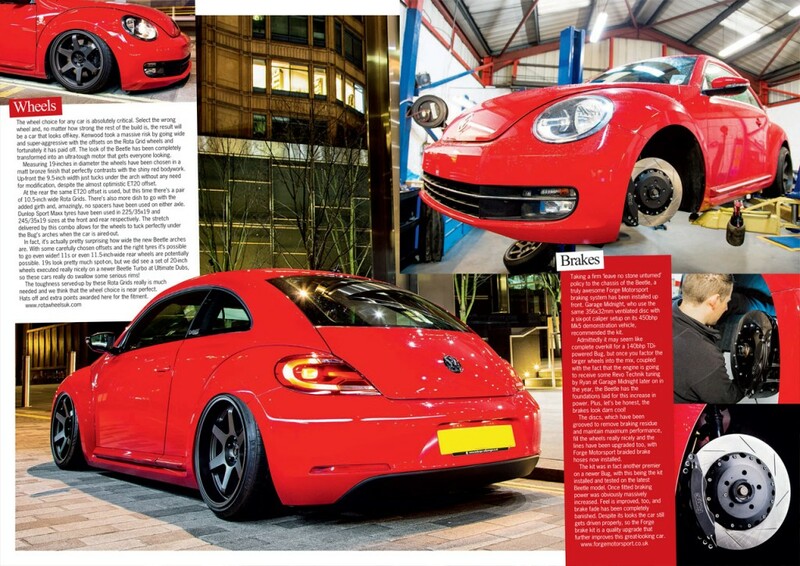 Kenwood Beetle in Performance VW Magazine! 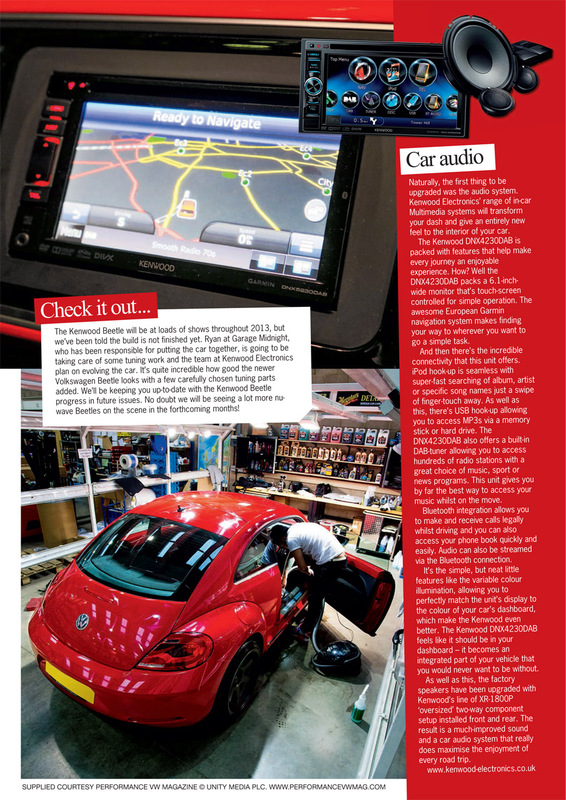 A few years ago building an audio demo car was all about going as wild as possible – you know the sort, TV screens for headlights and subwoofers in the seats! But in 2013 Kenwood Electronics has completely changed the way we look at these vehicles by building a super-cool, super-low Beetle using just a handful of key modifications. The Beetle’s exterior and stance instantly grab your attention thanks to a full Airlift Performance Digital Combo kit allowing the air suspension to be adjusted with millimetre precision. This allows the Japanese-style Rota Grid Drift wheels that measure in at 19×9.5in ET20 (front) and 19×10.5in ET20 (rear) a seriously aggressive setup which tuck deep into the standard arches at the press of a button! Inside our new DNX4230BT headunit packs a 6.1-inch touchscreen monitor loaded with Garmin European Navigation, iPod connectivity, DAB radio and much more! This unit gives you by far the best way to access your music while on the move, and is the perfect OEM upgrade which allows you to further upgrade the car’s speakers when you’re ready. 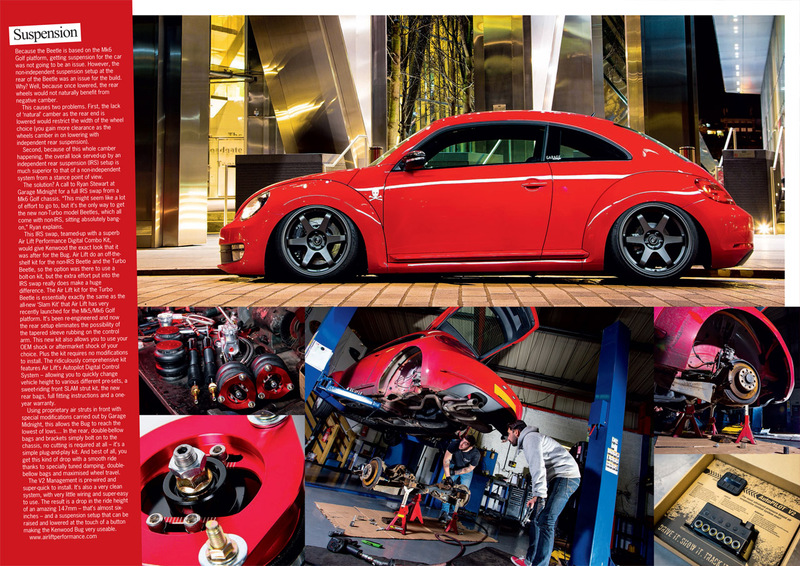 You can check out the full build of the 2013 Kenwood Beetle by picking up this month’s copy of Performance VW magazine which not only includes a full 7-page feature (documenting each upgrade in details) but also a super-glossy poster too. We’ll be showcasing the Beetle at a range of shows throughout the year including Players Classic @ Goodwood next month, so make sure you come over and check it out!